Cut Capers | Cut Capers Debut Album! 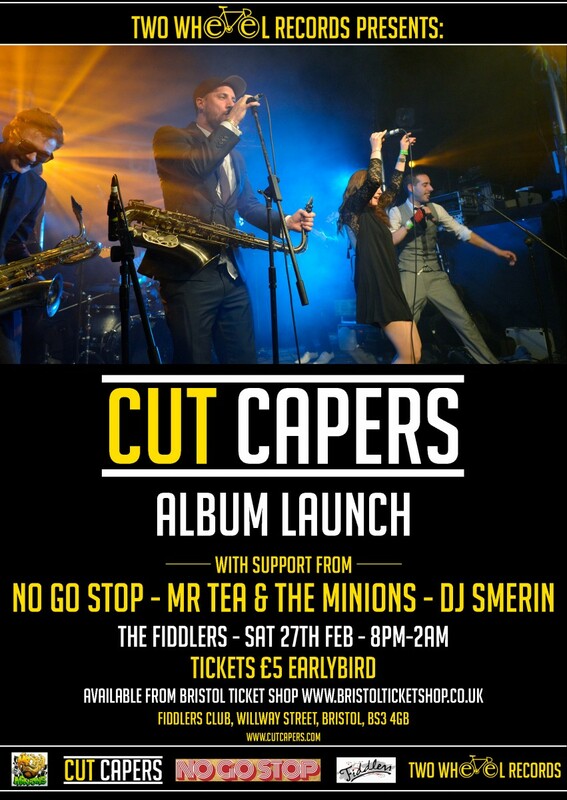 The Cut Capers Album is here… almost! This 11-piece juggernaut has quickly become Bristol’s go to for high class afrobeat music. Much more than a tribute to past glories, they are a living, breathing evocation of the life-force that is Afrobeat. Driving percussion, brass encrusted rhythms and epic instrumental solos set the pace while echoes of Old Soul from Marie Lister’s Vocals, catch the timeless quality of that ancestral funk sound. No Go Stop are truly on a mission to bring something exciting and new whilst staying true to Fela Kuti’s musical mission to present the heart of jazz with the soul of Africa and keep you dancing till dawn. Not to be missed! Mr Tea & The Minions play their own unique take on high energy Cheeky Gypsy party music – combining Gypsy flavoured Ska, Dub and Swing with an infusion of soulful melodies, cheeky Eastern riffs and booming beats and bass! Guaranteed to get you moving from the off! Legendary DJ George Smerin, founder of Bristol’s own Smerins’ Anti-Social Club, will be playing the finest cuts of dub, hiphop, swing, reggae and latin all night long. Earlybird Tickets are going at £5 – not many left, get in quick! © 2019 Cut Capers. All rights reserved.